INDIANAPOLIS, IN–(Marketwired – Aug 3, 2015) – Stevia Corp. (OTC PINK: STEV) (“Stevia Corp” or the “Company”), an international farm management company and healthcare company focused on the commercial development of products that support a healthy lifestyle, including stevia and hemp and their compounds is pleased to announce that its wholly-owned subsidiary Real Hemp LLC has launched its online store at www.RealhempStore.com featuring Realhemp™ branded food and skincare product lines targeted to retail customers. The Realhemp™ food line features organic, all natural hulled hemp seeds and protein powder. Realhemp™ Hulled Hemp Seeds are extremely versatile nutritious seeds that can be added to countless dishes providing substantial nutritional benefits. Realhemp™ Protein Powder is a complete protein providing all 9 essential amino acids that is easy to digest with high amounts of insoluble fiber and no additives. It is processed using a method that produces a smooth powder with no grittiness and with a natural balance of protein, fiber and essential fatty acids (Omega-6 and Omega-3) which sets Realhemp™ Protein Powder apart from other protein supplements on the market. The Realhemp™ natural skincare line features skin salve, hand liniment, and lip balm products made with natural ingredients featuring hemp seed oil. Botanical Pomegranate Skin Salve and Botanical Vanilla Skin Salve are thick body creams that provide immediate and deep penetrating moisture for skin in any condition. The Shea Butter Hand Liniment with hemp seed oil provides intense and repairing hydration for even the driest and calloused of hands. Lastly, the all-natural lip balm comes in botanical pomegranate or vanilla and does not coat your lips with wax but instead, penetrates your lips with natural lasting moisture to end the cycle of dry lips. Both the food and skincare lines of natural products can be used in conjunction with each other to offer a well-rounded, natural lifestyle combining health, happiness and overall longevity, aesthetically and internally. The benefits hemp brings to countless types of products are truly endless and the company plans to add several products to the existing lines as well as launch additional product lines in the coming months. 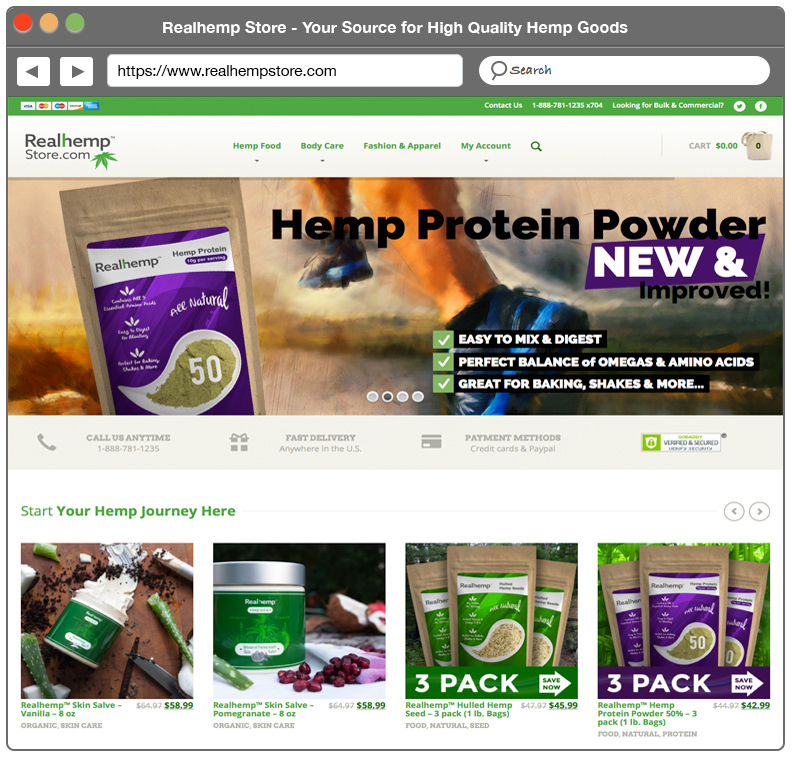 The online store and Realhemp™ branded products will be managed by the Company’s wholly owned subsidiary, Real Hemp LLC, which was formed to focus on commercializing industrial hemp and its related products.